Here’s a recipe I devised for a recent workshop on modern Alsatian food. 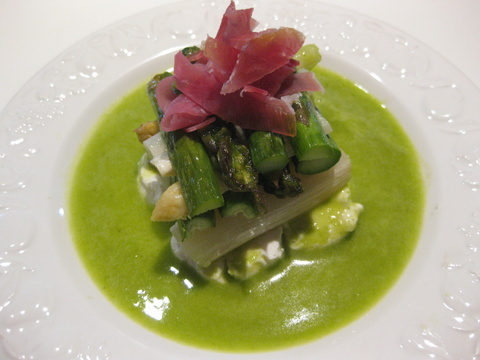 It’s a bit of a fiddle, but if you like playing around with your food and you love asparagus, it’s a winner. Serve with a crusty sarment loaf and a Muscat d’Alsace (what else) – a 2011 Cuvée Marie from Zusslin in Orschwihr, for example, or for a real/rare treat, a 2010 Clos des Capucins from Domaine Weinbach. With you Wendy on the lazy asparagus bit…just one of my reasons for preferring the green: snap off the woody ends, throw them in a roasting pan with some crunchy salt and olive oil and roast for 10-15 minutes depending on size. OR, if you prefer white, nip across to Hieber, buy them there and their super-duper peeling machine will do the job for you. Not keen on eating watery white asparagus in restaurants, whether in Alsace or Baden – hardly a test of the chef IMHO and they’re usually overcooked. Bon app/e guete!